Controversial Florida Law Provides Safe Passage for DUI Drivers Through Checkpoints? The Los Angeles DUI community has been hotly debating the pros and cons of a recent stunt that drivers in Florida have been pulling to avoid getting arrested at checkpoints. 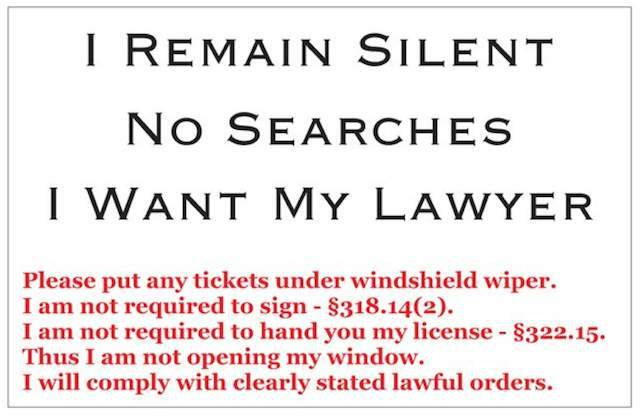 Please put any tickets under windshield wiper. I am not required to sign. I am not required to hand you my license. Thus I am not opening my window. In the video, officers can be seen approaching each car at the DUI checkpoint. The drivers then each hang their printed notices outside of their driver’s side, wrapped in plastic. They slow down to let the officers read the paper. The vehicles are then waved along without being subjected to searches. The action drew outrage from various online media channels. Critics say this strategy unfairly protects inebriated drivers, giving them a free pass to drive on and possibly cause even fatal injuries to themselves or others. Champions of this tactic say that the police have no right to unfairly search a car without suspicion. The question remains: should a police officer be required to witness reckless behavior before stepping in, or is it better to be safe than sorry? The Supreme Court ratified the legality of DUI checkpoints a few decades ago, but police stull routinely violate the Constitutional rights of drivers both at checkpoints and at random stops. 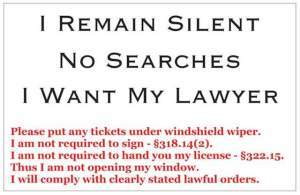 If you suspect that police pulled you over without probable cause – or because of the color of your skin – you may be able to use that information to construct a powerful defense against your charges. A Los Angeles DUI lawyer with the Kraut Law Group can provide detailed, smart assistance with your legal challenges.